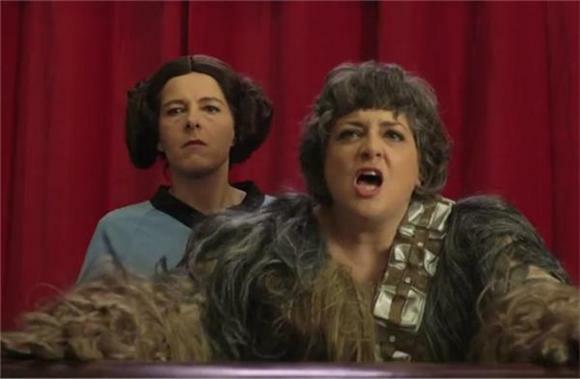 After releasing "These Aren't the Droids," a comedic track about how perpetual teen fanboys rule pop culture and basically the rest of the world, Neko Case and Kelly Hogan have made a funny video to go along with their equally amusing song. The ladies take on one of the most longstanding and extreme fandoms, that of Star Wars, with Case sporting a Princess Leia wig and a misplaced Spock uniform, Hogan wearing a Chewbacca costume and actress Ellie Kemper dating an inattentive Storm Trooper. The singing duo mocks man-children and celebrates feminism all in the name of charity, as the song appears on 2776: A Millennium of American Asskickery, a comedic music album that raises money for OneKid OneWorld. Other notable contributions on the album are from Will Arnett, Samantha Bee Ira Glass, Ed Helms, Colbie Smulders, Reggie Watts, and many others. Check out the video below.